Certain rare nickels only become visible under the magnifying glass. Collectors use a close-up view of their coins to judge condition, find mintmarks and identify rare varieties of nickels. A second, close look, at today’s current Jefferson nickel has the potential to find something of value. The early years 1938 and 1939 are beginning to gain a premium. Importantly, if the small “D” or “S” mintmark is on the reverse of these dates, it quickly become a sough after collectible. Additionally 1942 through 1945 nickels contain a small, but valuable amount of silver. True, most of these silver nickels have been removed from circulation; however your box of old coins may contain examples. Look for a large P,D,or S above the dome of Monticello. 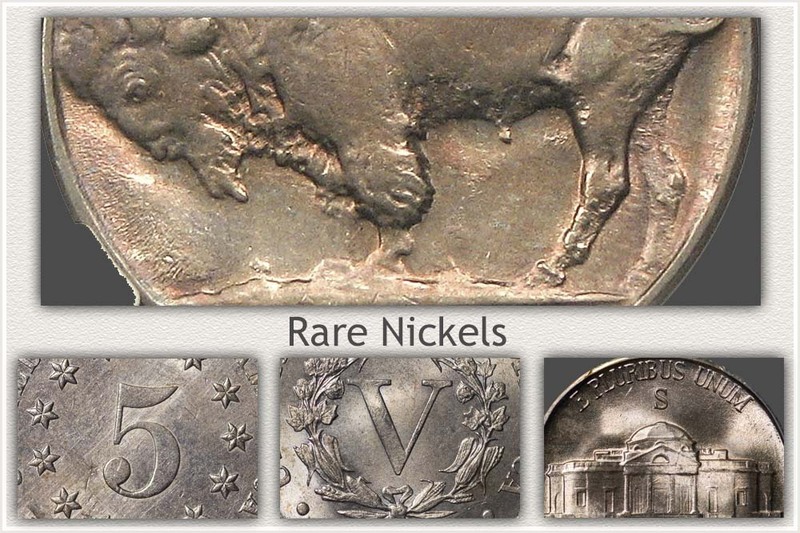 More information on these unusual rare nickels is detailed below. Another, and very popular rarity, is the Three Legged Buffalo nickel. A close-up is the top image on the left. A recognizable and different appearance from all other Buffalo nickels it has become a popular coin with collectors. Examine closely all of your 1937-D Buffalo Nickels, it might be missing a leg. It happened at the mint, while cleaning one of the dies used to strike the coins; the mint polished away the front leg of the buffalo, creating rare nickels. A three legged buffalo nickel in good condition, a heavily worn coin, one that passed through many hands undiscovered, is valued today at over $250. How many of these are in collections waiting discovery? Shield Nickels: Important as the first of the denomination. All are awarded a premium. Began in 1866 with large mintages, but soon production began to decline. Very scarce are the years 1879-1880 and 1881. 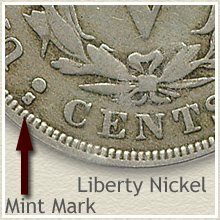 Liberty Nickels: These were minted the years 1883 to 1912. A few scarce and valuable rare nickels are scattered throughout the series. 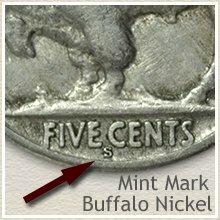 Buffalo Nickels: Became a hit with everyone in 1913 and still enjoys huge demand by collectors today. Condition is so important with this series; high grade is where the value is found. Jefferson Nickels: Current nickel of US coinage. First minted in 1938 most are collected in Mint State condition. Notable for the silver nickels in the series, which are easy to identify, see the details below. Following is a chart of the standout scarce and rare nickels of all series. Listed are rarities from the first Shield nickels, followed by the Liberty series to Buffalo and Jefferson nickels. Rare Nickels: Often it is all about Condition. Collectors treasure coins in the best condition possible. The better the condition of your coins, the higher the value. A worn coin is less desirable and less valuable than one in excellent condition. Therefore collectors are always striving to place the nicest in their collections. There is a rigorous system of "Grading" coins. With several grade categories, ranging from crisp, no wear "Uncirculated" to a coin almost worn smooth in "Good" condition. With many subtle differences in the details of the condition affecting the grade of a coin. Many rare nickels are known for their "condition rarity". Examples worth five to ten dollars in "Good" condition are suddenly valued at a hundred dollars or more in "Extremely Fine" condition. As the condition improves these old coins become highly collectable. Two dates in the Buffalo nickel series jump out as condition rarities, the 1921-S and 1926-S. Hundreds of dollars difference from heavily worn to lightly worn. Steadily going up and worth over $0.70 each are nickels minted 1942 through 1945 with a large "P" "D" or "S" mintmark on the reverse above the Monticello dome. Each contain silver and with today's silver value these silver nickels are rising quickly in price. 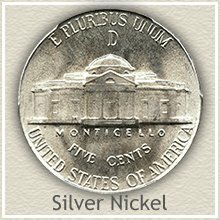 As always, if your coins are in nice condition it is taken into account with the possibility of increasing how much a silver nickel is worth. Small details, many so small a magnifying glass is needed to detect, discover valuable nickels. A coin’s date is only the first step in the value process. 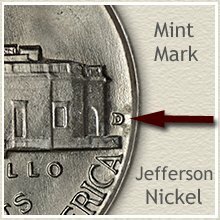 Next locating the presence of a mintmark, if any is necessary. Hover over to expand the images highlighting mintmark locations. Also, judging condition is more difficult, although very important. Finally, awareness of possible varieties known of the coin. The above chart is not all inclusive of valuable nickels. Many more date and mintmark combinations are worth above a nickel's five cent face value. Each of these subtle details are covered in full, including value charts for each series. Have a look through your old nickels. Shield and Liberty "V" nickels are gaining in status with higher values. Even Buffalo nickels without dates are worth 10 cents each, amazing. Compare your coins to the "Grading" images to judge their condition then check their value on the coin value charts. 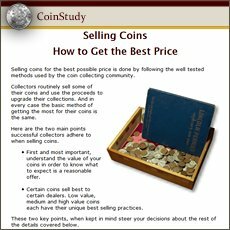 Coin Values Discovery... finds Rare Nickels and... All old US coin values. It is an excellent index with images and text links to all coin series, from Cents to Gold. Value charts, grading images and descriptions uncover how much your box of old coins is worth.